The new BMW M5 Saloon is the fastest, baddest version of the wonderful 5 Series Saloon. It’s a high performance, super-saloon car that bosses the tarmac with its 4.4-litre V8 engine. Four-wheel-drive is standard but the car retains BMW’s classic rear-wheel-drive feel, and it works well as a motorway cruiser and a winding road speedster. All you need to be prepared for is to have some fun. OSV takes a closer look at what it’s all about with our 2018 BMW M5 Saloon review. A twin-turbo 4.4-litre V8 petrol engine provides the power, developing 592bhp. That’s enough to allow you to cover the 0-62 sprint in just 3.4 seconds, which makes it one of the fastest cars in this sector. It’s impossible for us to do justice to the way this car sounds here, but let’s just ask you this: Have you ever heard a car scream? If you haven’t, you’re in for a shock. The M5 howls like an actual demon, and it’s a fizzing sound that some will love while others will hate. The way the car feels will divide opinion, too – it feels like a racing car. While some of you will be salivating at that prospect, others will be left wondering why a saloon car – no matter how “super” it is – feels that way. It was BMW’s prerogative to make a fearsome version of their 5 Series, and they’ve really pulled it off. However, the M5 is just the start of things. Next up is an M5 Competition model that raises even more hell. It develops an avalanche of power, topping you up to 616bhp and decreasing its 0-62 time down to 3.3 seconds. We’re edging closer to the speed of light here! That said, where the Competition model differs from the standard model isn’t really in the area of straight line speed. Instead, BMW have tweaked its suspension setup so that performance is significantly better. It’s more responsive and more accurate. It will also cost you an extra £6,500. Both models come with four-wheel drive as standard, but the system doesn’t make the car too heavy handed. It arms you with lots of grip but, ultimately, it almost feels like any other rear-wheel-drive BMW. Ceramic brakes, meanwhile, are optional and will set you back a further £7,500. The M5 might be a high-performance car, but it’s also a Saloon, and as such it has a few obligations. One of them is to make sure you’re as comfortable as possible, and it succeeds very well on this front. The supportive sports seats up front offer plenty of comfort and switching to Comfort mode primes the car so that it smooths over poorer surfaces. The dashboard is neatly laid out, and everything is easy to find and use. As always, the brand’s newest version of their iDrive infotainment system is present and correct, and it now comes with a 10.25” screen. Also standard is a touch-sensitive rotary controller, as well as digital dials that bring the car into 2018 nicely. Is the BMW M5 Saloon practical? The seats are pretty chunky, but they don’t take up too much room. That said, those seated up front have more space than those in the back, although rear seated passengers won’t feel too short-changed. Longer trips could be a bit testing back there though. Storage solutions are good and include a satisfyingly-sized glovebox, while the boot measures 530-litres. This is all the more impressive when you consider that four-wheel-drive is standard. How reliable are BMW? We’ve looked into reports of BMW reliability and have written our own honest assessment of the brand. 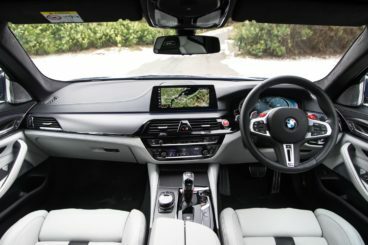 Standard kit is good, with the M5 model getting leather upholstery for the heated powered sports seats, all-round parking sensors, a head-up display, a digital radio, sat-nav, digital dials, iDrive, adaptive LED lights with high beam assist and four-zone climate control. The M5 Competition model adds suspension tweaks, more power, more gloss black trim and 20” alloys. Optional for both models are ceramic brakes and a £1,100 sports exhaust. In terms of how safe the car is, the standard 5 Series Saloon has a 5-star safety rating, but this high-performance version won’t be tested. Its standard safety kit includes adaptive cruise control, rear cross-traffic alert, lane departure warning and an excellent autonomous emergency braking system. Prices for the new car start at £89,645. For more information on our leasing deals, you can check out our page here. In terms of its running costs, the sole petrol engine wasn’t designed to be economical. On a good day, the standard model can return 26.9mpg, while the Competition model is good for 26.1mpg at best. Emissions meanwhile are pegged at 245g/km of CO2, and the car has the highest BiK rating possible. All M5’s cost £140 a year to tax, but because they also cost over £40,000 to buy in the first place, you’ll also be liable to pay a surcharge of £310. That takes your annual bill up to £450. Not cheap then, and the M5 also occupies the highest insurance group possible. A bulging 4.4-litre V8 engine growls beneath the bonnet and arms the car with a salivating 592bhp. Despite the staggering performance figures, this is still a saloon car. To that end, it’s super comfortable. The standard 5 Series model has a 5-star safety rating, while the M5 comes with powerful brakes and a long list of standard safety kit to reassure you. It’s probably a sign of the times, but while the M5 works undoubtedly as well as a high-speed cruiser, it’s definitely lost an edge. Its price tag means a lot of buyers will be seriously questioning its worth over cheaper rivals, and indeed the standard 5 Series. 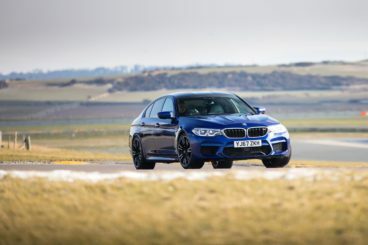 Let’s see how the car fares against its rivals in the comparison section of our 2018 BMW M5 Saloon review. The new Mercedes E63 is the AMG, high-performance version of their E Class exec saloon. 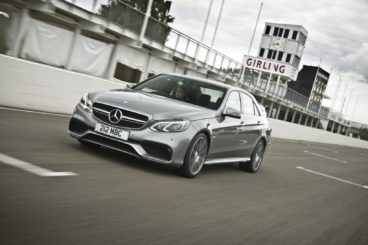 On the road, Mercedes are well-known for prioritising comfort over entertainment, but the E63 delivers a first-class driving experience. Power comes from a twin-turbocharged 4.0-litre V8 engine that develops 563bhp. Four-wheel-drive is standard, the car handles phenomenally, and it isn’t as intimidating to drive as it looks or sounds. It’s noisy too, with the engine spitting furiously as you put your foot down. And thanks to air suspension, it’s pretty much as comfortable as you expect a Mercedes to be. That said, you can flick between driving settings so that the car is either more comfortable or more fun. The steering, meanwhile, is precise and sharp, and body lean is well kept in check. There’s also an S model worth mentioning. This is one of the fastest and most advanced super saloons on the road, and it has a 0-62 time of 3.4 seconds… Hair-raising stuff. Running costs? In standard guise, the E63 can manage 31mpg if you drive like a monk, while emissions are pegged at 208g/km of CO2. It sits in the highest BiK car tax band there is. Inside, it’s business as you usual for Mercedes. There’s luxury everywhere you look, from the carbon fibre trim to the Nappa leather. The performance seats are both supportive and comfortable, insulation is excellent and the adjustable suspension ensures that it’s a pleasant place to spend your time. It’s a bit of a shame that only the S model gets the twin-monitor widescreen multifunction display as standard, however. Is the Mercedes E63 Saloon practical? It’s a big saloon that’s spacious enough to accommodate four passengers on longer trips without much hassle. Leg and headroom is excellent all-round and the boot – which is a good shape – measures a very handy 540-litres. 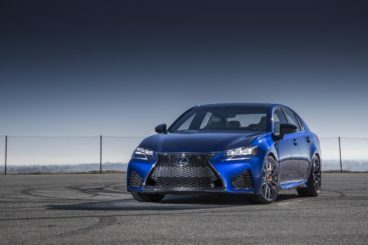 The new Lexus GSF is the alternative choice in this sector, and its lack of badge appeal is usually what means it ultimately loses out to its rivals. That said, it isn’t just the fact that it’s not a BMW which means it doesn’t sell as well as the M5. With a 0-62 time of 4.5 seconds, it’s over a second slower than its competitor. It’s also not quite as powerful and develops 466bhp at the most. Moreover, unlike both the BMW and the Mercedes, there’s only one model available, which means there are no ridiculous 0-62 times of 3.3 seconds. Despite this, we wouldn’t write the GSF off just yet. It’s powered by a terrific, spine-tingling V8 petrol engine, corners superbly, and comes with a dynamic drive system that lets you switch between four different driving settings. We prefer Normal mode the best, as it blends sharpness with comfort to great effect. All models come with adjustable adaptive variable suspension, while the sound of the engine is a joy to behold. Overall though, it can’t quite match the M5 for handling finesse, and you’re always aware of its weight. Moreover, a dated automatic gearbox further weakens its appeal. Running costs? These large 5.0-litre V8 engines are never cheap to run, but with a 0-62 time so much slower than the BMW you’d be forgiven for expecting better returns than 25.2mpg. That’s just the official figure too, and it’s likely that you’ll be averaging 19mpg. Emissions meanwhile stand at 260g/km of CO2. Inside, this car might lack the out and out badge appeal of the M5, but no one can say that this isn’t a top-notch interior. It’s stylish and luxurious without being class-leading, and when it comes to comfort there are few cars on the market that can beat it. The materials used are all of a good quality, and we think buyers will especially appreciate the sporty trim inserts and suede-effect Alcantara. There’s also lots of soft leather on display here, although it’s a bit of a shame that the likes of a classy Mark Levinson stereo and a sunroof aren’t standard. Is the Lexus GSF Saloon practical? It’s certainly roomy, with both those upfront and those in the rear well-accommodated. Head and legroom is good and the car doesn’t really feel any less usable than the standard saloon on which it’s based. Its boot is even quite large and measures 480-litres when all five seats are up. Let’s face it, basing a car on the magnificent BMW 5 Series means that BMW couldn’t go wrong with this one. It’s a super saloon that just had to build on everything that makes the 5 Series so good. That it does, but the problem is that it doesn’t necessarily build on everything that made the previous M5 so good. Don’t get us wrong – this is still a very, very special car that deserves a 5/5 rating. But it’s not as engaging as its predecessor, and it also doesn’t sound as good. If these are the two attributes that make a saloon super to you, you might be in two minds. That said, no car can hold a candle to the previous M5 – and this new BMW M5 Saloon is as close as you’ll get.